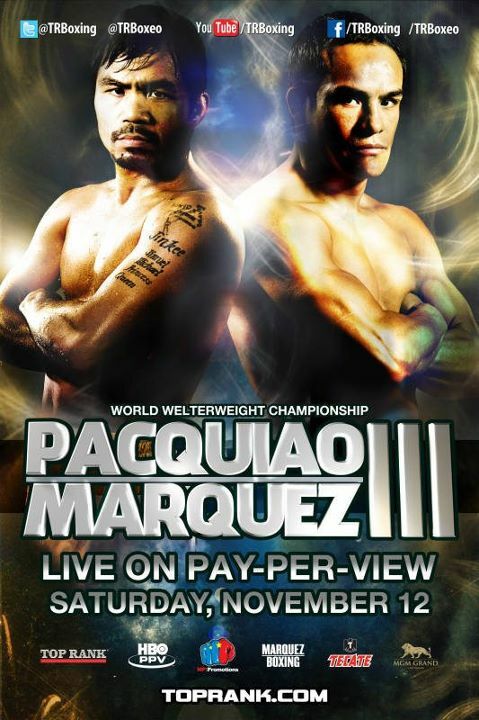 Next Month, 12th of November 2011 is the Awaited 3rd Rematch of Pacquiao vs Marquez. Philippines' Manny "Pacman" Pacquiao with Professional Boxing Records of 53 wins -3 Losses -2 draws, 38 wins via Knockouts and The no. 1 pound for pound boxer and WBO welterweight champion VS Mexico's Juan Manuel "Dinamita" Marquez with Professional Boxing career records of 52 wins -5 losses -1 draws, 38 wins via Knockouts. The Pacquiao vs Marquez 3 fight is a welterweight championship at 145 lbs. weight, Marquez looks forward to grabbed Pacquiao's welterweight belt. Their trilogy match is scheduled on Saturday, November 12, 2011 (Sunday, November 13, 2011 in the Philippines) at the MGM Grand Garden Arena, Las Vegas, Nevada. Aside from Pacquiao VS Marquez 3 Online Streaming Links and Websites available on the Internet (though it wont be easy to find them) Local Restaurants in Cebu might hosts some Manny VS Marquez 3 HBO Payper View plus Buffet Launch or Drink for as low as 500 pesos or higher. Pacquiao VS Marquez 3 HBO 24/7 Videos would also be nice to watch since HBO 24/7 Coverage Videos on Pacquiao VS Marquez Fight on November will showcase both Pacquiao and Marquez Biographical Info including their 24/7 reparation before entering into the ring on November 12. By the way, HBO will hold the official rights to air the Pacquiao VS Marquez Fight on November so we must expect a thorough coverage via HBO 24/7 footages of Pacquiao VS Marquez endeavours, training and some sparing fights. In the Philippines, Pacquiao VS Marquez 3 can be watched for free at local TV - GMA 7. 2 comments: on "HBO Sports will officially air Pacquiao VS Marquez 3 Fight on November 12"
btw, we had a great time there @ metrowalk..